It usually starts with a phone call or a text, we don't decide too much, just who is going and what time. 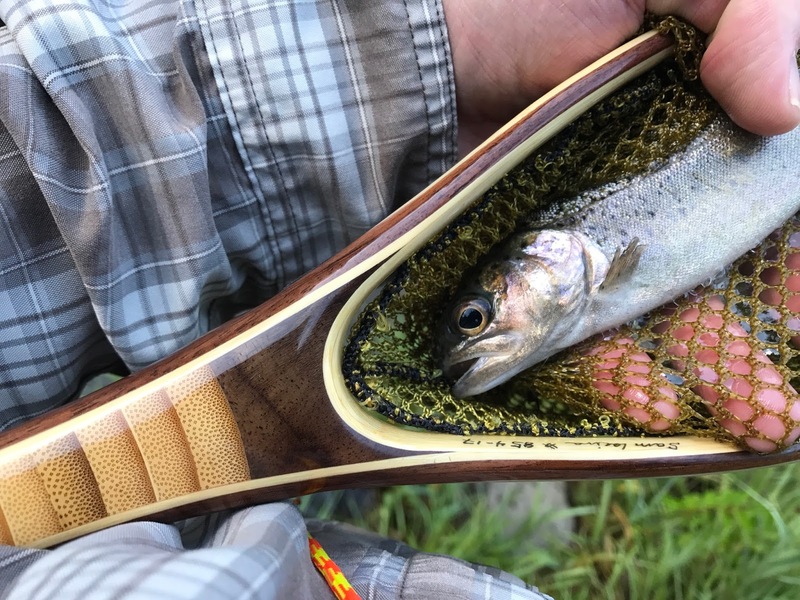 This trip started like any other except maybe not exactly true, we were stoked up on fishing Oak Creek 2 weeks ago, we killed it, pegged the fun meter, we wanted to do it again. Jim and I work hard, we have jobs where we take care of people but in different ways. We care and at the same time, we are very sarcastic towards each other, cursing, lying, it's all done to see who is going to do the best at coming up with the most ridiculous thing to say. It's just another way we have fun. Sarcasm, lying and making fun of each other. We are compatible this way. So I set the alarm as I always do, wake up, go to the bathroom and do all that, pull on my pants, grab my stuff, this time, I didn't pack the night before, that's ok, I can get ready quick. Grab a bag, a rod, this time I chose the Sato and that was a mistake (Oak Creek is Ito water) but it still worked out. Pick up my boots, neoprene and liner socks and my new net. Done, throw it in the back of my Nissan Cube. I'm excited, I want to use my new net and get some pictures. I also brought along my fly tying kit, I didn't have the new bead head kebari I designed, figured I would tye it up on the drive. Press the button to start the car, back out, plug in the phone and select some music, this time, Benjamin Clementine, such a beautiful voice, check him out. And I drive the 2 minutes to meet Jim at his house. I open the back of the Cube and get ready to grab my stuff. Jim already has his bag in hand and is walking to my car looking like he is going to put it in the back. I'm thinking to myself, if he wanted to drive... Nevermind, he will be reading this. "Put your crap in the car, I'll drive"
And the next thing, we are driving North in the gentle rain of the monsoon. "This is going to be a good trip you know, starting off raining." "Yeah, it's going to clear up when we get there. That's what Accu Weather says, it was only 10 minutes off last time." We get to be kids again when we are together. Two old men, new friends, we spend lots of hours together behind the wheel and now on the stream. We have families, our kids play together, our wives are friends, it's all good and the two of us together? We like to drink a little. Why not? We are professionals, steady jobs, we grind it out, taking care of all the things we do. But some of you don't drink so we won't go there, never mind that stuff, you wouldn't understand it. Each of us is like a needle, a pin and we are looking to pop the balloon that is our ego. I like to take the pin and poke at his, he does the same. Girls will not understand it, it's what men do, sarcastic old men, they make movies about this stuff, again, never mind. The drive goes quickly, through the crystal town of Sedona, no chocolate milk stream this time. The creek is high but nothing to worry about. Each of us is cripple in some way, Jim's back, my ankle, we hobble and sway down the wire rock boxes that control the erosion and drop into the school yard. And we are kids again. It's a formula for me, except this time, I've added in a friend or two. For so many years I've fished alone. I've tried to invite others, too different, schedules different, not enough in common to do the hours behind the glass. I have two old and new friends that I've shown tenkara and they now know my madness. It's like a virus, can't get rid of it. Only hanging out with each other will help alleviate the symptoms. So we did it again this morning and it was good. Less than twelve hours ago. Now it is a memory. ...and we will do it again.